Canada Lynx is a mammal species belonging to the felidae or cat family. These North American mammals are also known as the Canadian Lynx. 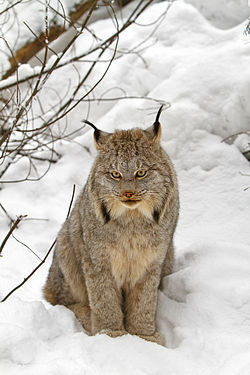 Some people consider this species as conspecific with the Eurasian lynx which is a close relative of the Canada Lynx. The appearance of these medium sized animals resembles other species of the lynx genus. This species is smaller than their Eurasian cousins. Size: Their body grows somewhere between 31 inches and 41 inches (80 cm and 105 cm) with a 10 to 15 cm long tail tipped with black. The shoulder height of these animals ranges from 19 inches to 22 inches (48 to 56 cm). The male lynxes of this species are larger than the females. Weight: These animals usually weigh between 18 and 24 lb (8 kg and 11 kg). Body: The silvery brown fur covering their body may have black markings. Their fur coat appears reddish brown during summer. Their furry ruff bears resemblance to a double pointed beard. These mammals have long and furry tufts on both ears. Legs: They have long legs covered with fur. Teeth: They have 28 teeth like other lynxes. The four long canines help them in gripping and puncturing. The canines have nerves that help these lynxes to feel where they are biting their prey. These carnivorous mammals use their four carnassials to cut the meat. These animals are found in the forests of Canada and Alaska. Their distribution range also includes many US states like Washington, Montana, Oregon and Idaho. Canada Lynx populations can be found in the Yellowstone National Park and the Medicine Bow National Forest in Wyoming, United States. Two populations of this species are known to live in the Cape Breton Highlands. They inhabit particularly dense, coniferous forests. These wild animals generally inhabit rocky areas around swamps and bog. The home range of these territorial animals extends from 5.8 to 19 square miles (15 to 50 km2). They have a tendency to stay within approximately 90 meters (100 yards) of the tree line. A large portion of the diet of the Canada Lynx consists of snowshoe hare. They eat other small and large birds. This species also diet on animals like meadow voles, deer and caribou. They consume 600 to 1,200 gram food in a day. Like many other lynx species these animals are mostly nocturnal. However, they may be active any time of day. These mammals are very solitary and secretive in nature. They tend to hunt in higher altitudes and snow covered areas to avoid predators. They use scent-marking to specify their territorial range. During scarcity of food, they travel much farther than their usual hunting range. They use their sharp eye-sight and large ears to find prey. They usually hunt by ambushing the prey. Sometimes, they drag and hide killed animals behind rocks or bushes for later consumption. When food is scarce, they hunt as many preys as possible and store them for future use. Females and cubs of this species can be seen hunting together. 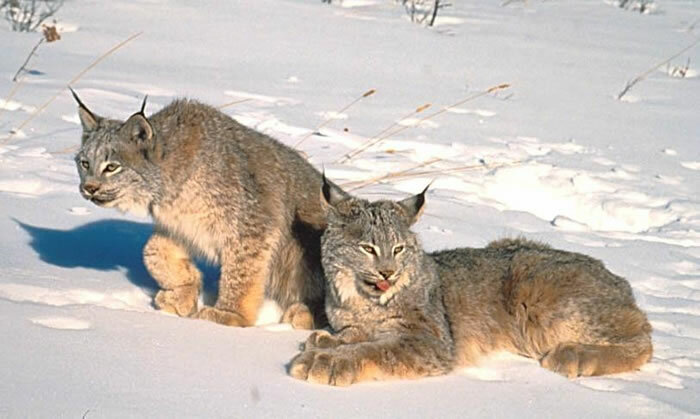 The predators of this lynx species include bobcats, wolves, coyotes and fishers. The soles of their feet have a thick fur cover helping them to travel through deep snow. The first and second toes of their feet have a large gap between them to help the Canadian Lynxes to maneuver through deep snow. Their big toe makes a wide angle with the rest of the toes providing them with a vice like grip on snow. The reduced numbers of pre-molars along with the large spaces between the canines and the other teeth ensures that they can bite their prey as deeply as possible. The reproductive season of this species lasts for a month sometime between March and May. It depends on their habitat and local climate. This species often do not reproduce during scarcity of food. 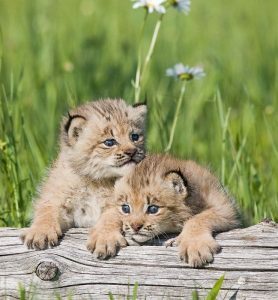 The infant mortality rate can go as high as 95% for cubs born in leaner years. 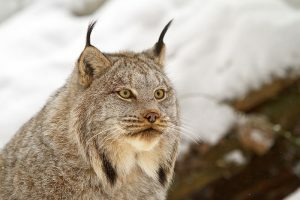 One male Canada Lynx may mate with more than one female. Gestation lasts for approximately 64 days for this species. The females build south or southwest facing maternal dens in shrubs and thickets as their nest. They give birth to 1-8 young lynxes sometime between May and June. The young lynxes are born blind. Their eyes open two weeks after their birth. 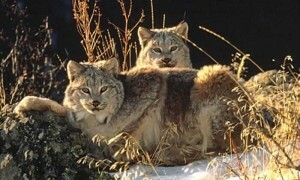 The eyes of the young Canadian Lynxes are initially blue turning brown or hazel as the animals mature. 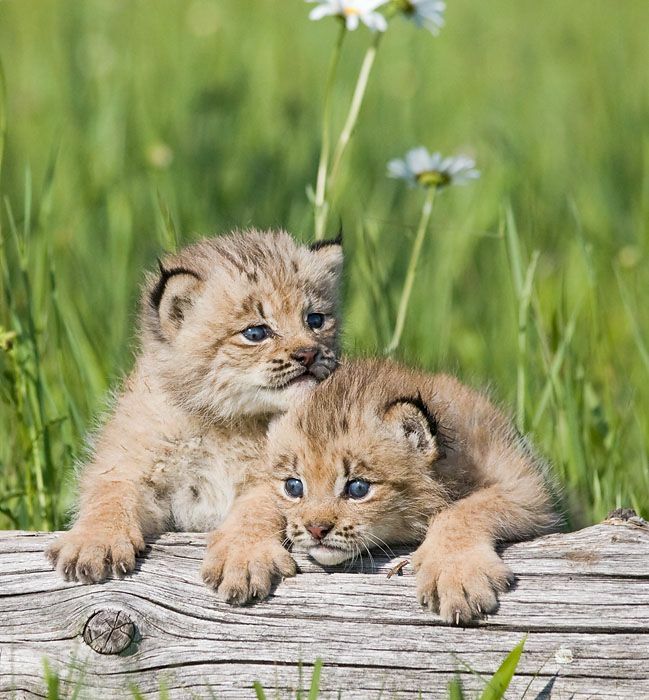 They start hunting when they are seven to nine months old. The cubs leave their mother after ten months. They reach the full size only when they are two years old. Female Canada Lynxes become reproductively mature at ten months of age while the males take somewhere between two to three years to reach full maturity. The average life span of this species is around 15 years. This species is included in the “Least Concern” Category by the IUCN as there are no immediate threats to their existence. However, the US Fish and Wildlife Service designated them as a threatened species in the contiguous United States on March 24, 2000. Habitat loss is one major threat to their existence. The long legs of these animals can support twice as much their body-weight. One lynx of this species has been reported to have swum two miles across the Yukon River. 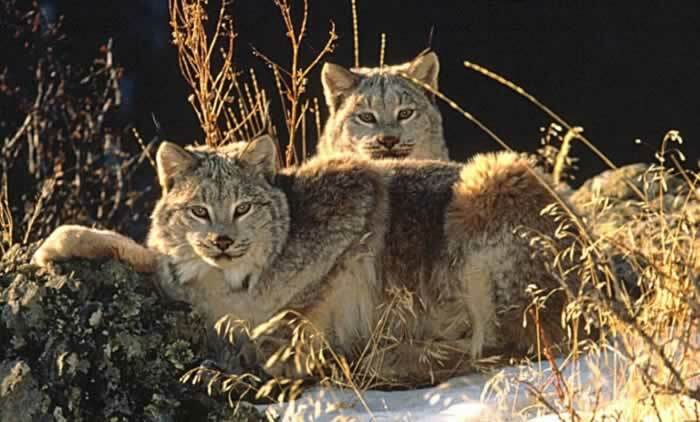 Mother Canada Lynxes bring food for their cubs and allow them to play with foods before eating to train them for hunting. Lynxes derived their name from a Greek word meaning “to shine”. This probably refers to the reflective ability of their eyes. Find out below about the appearance of this incredible wildcat species.